I started with Cost To Cost (CTC) which is hosted in a very large area at first floor of Farm Bhavan building. They put up print outs of the pricelist for everyone to see, which is also available publicly online. So that does help a little. A little since there are some problems with their method. First they use abbreviations to overcome the space limitation. Secondly, they seem to have limited stuff, so you won’t be able to find anything which is not in that pricelist. Lastly, the prices are without the VAT, so it confuses you and more so if you don’t know the exact tax rate. VAT in our case was 5% and it made us do additional calculations while documenting the prices. Fortunately in CTC, there are also guys at the counter who create quotes for whatever things you want to buy, no matter if you are going to buy them or not. After we got a quote from CTC, we moved on to Computer Empire (CE) which is just a small distance from CTC on the same floor, but in Meghdoot Building, which is connected to Farm Bhavan. Computer Empire seems to be having a small footprint where land area is concerned, which barely have enough space for half a dozen people to stand at once. But since they (probably) have a big godown nearby, and also since they provide good prices, CE is a choice among many tech enthusiasts for shopping. Getting a quote from them was a daunting task. Due to a small space and the crowd it wasn’t much appealing. Once we got the quotes from all three shops it was time to tally and to compare the differences. Some didn’t have the exact component that we wanted and other tried to pass on Green WD HDD saying that it’s better than Blue HDD. It reminded me of the last time when Cost to cost literally gave me the Green WD HDD instead of Blue one and quoted on my face that both are the same thing and that colour doesn’t make a difference. I had to return the Green HDD to them and buy a blue one from another place since they didn’t have it in stock. We originally intend to buy RAM and HDD from CE since prices were lower there, but since SMC are a little apprehensive of losing customer (as I talked earlier), they lowered the price of HDD from 3600 to 3500 and also gave a good deal on G.Skill RipjawsX RAM. However I did have to ask them to replace the C10 latency RAM with C9 one, since I had to. I wasn’t able to get Antec VP450P and ended up buying BP450S, which cost a few hundred less than the former and I saw no significant difference in specs. Further analysis revealed later that the only advantage of VP450P over BP450S is that the former one have APFC (Active Power Factor Correction) which would provides a better efficiency and that Antec’s warranty is 2 years compared to the Corsair PSUs. But we do have a program that allows us to extend the warranty by one year officially. So the warranty is not a con now. (Thanks to this thread). 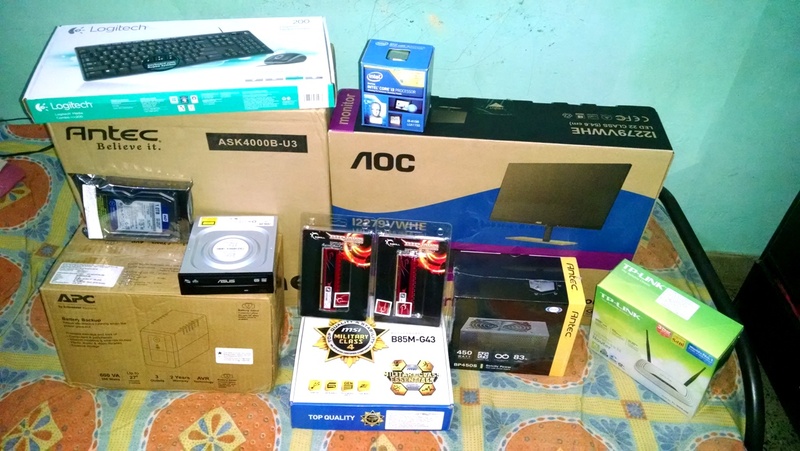 In the end all the components combined along with UPS and Router cost us Rs 37,265. Had I purchased everything online it would have cost me upwards of Rs 43K, though not all components could be bought online, like the monitor. After bringing all the components at home we also had to go a furniture shop to buy a computer table and a chair. Once that was installed my work began to finally assemble the PC. Assembling the PC proved to be a task of much patience. Since I was doing it after about a year. Plus I didn’t want to rush and do something wrong with the components. My friend was watching the process with gleaming eyes. After all he had spend considerable amount of hard earned money to get his first PC. First I opened the processor and installed it on motherboard. Then I mount the mount screws inside the cabinet where motherboard would be fixed later. MSI B85M was then mounted over those screws and tightened. After which I installed the heatsink and fan over the processor. Did I forget anything? Yes, indeed. I forgot to attach the back panel of motherboard like I always do. So I had to reopen the motherboard, then attach the back panel in place, after which the motherboard was reseated on the mount screws. The power supply was the next thing to be fixed. Antex BP450S isn’t a modular PSU, neither are any of the wires sleeved, so there were bound to remain a mess of wires but I tried to manage the cables as neatly as possible. Bigger problem I faced was installing the hard drive. I wasn’t able to find a suitable position for installing it without it protruding towards motherboard. The screw holes on the hard drive wasn’t aligning completely with the holes in the space in the Antec chassis where I was trying to install it. It did feel weird since Antec is a good brand, I don’t think they messed up with this cabinet. Hence I may need to reinstall the hard drive later when I realize what am I missing. After DVD drive was installed it was time to attach all the wires to the motherboard. First I decided to attach the front USB headers and other cables running from cabinet since those are very small and tends to get difficult to attach the more the clutter. It took a considerable amount of time since I was being careful and trusting the motherboard manual, not to make any mistake. Installing the monitor was fairly easy and once we joined the UPS with the monitor and attached power cables to the SMPS, we were set. As soon as I pressed the power button the PC booted up. Watching the PC fired up in first attempt our joy seemed no bounds. But there was no OS. Owing to the front USB being USB 3.0, Windows 7 got installed in under 10 min from my USB 3.0 pen drive. I was amazed at the speed and the 1080p awesomeness of the monitor. I had never used a 1080p monitor before, which made me realize I need a new 1080p monitor myself. Soon enough I did buy myself a new monitor, but now I am running ahead of myself. I had finished assembling a brand new PC. And to commemorate the event my friend had planned to get a broadband connection of Excitel which I myself am very happy to a customer of. That was start of a problem. When the broadband connection was installed, we figured out that the LAN card was not working. I tried testing it on SuperX (a Linux distro) and indeed the ifconfig command didn’t show the eth0 interface, which confirmed that ethernet was not working. Apart from it there was also another strange problem. The input hardware (the keyboard and mouse) doesn’t work the first time we boot into Windows. But when the PC is restarted using the power button, those tends to work again. This problem was repeatable every time the PC was booted. While the later issue was annoying it wasn’t a show stopper like Ethernet not working. So my friend bought a Wifi dongle in the meantime. We plan to goto Nehru place again and to claim warranty on the motherboard. Will keep posted whatever happens next, and a little heads up, it isn’t pretty.